Ask any contractor and he will tell you that the true beauty of having a compact tool carrier is easy to grasp: one machine, many applications. 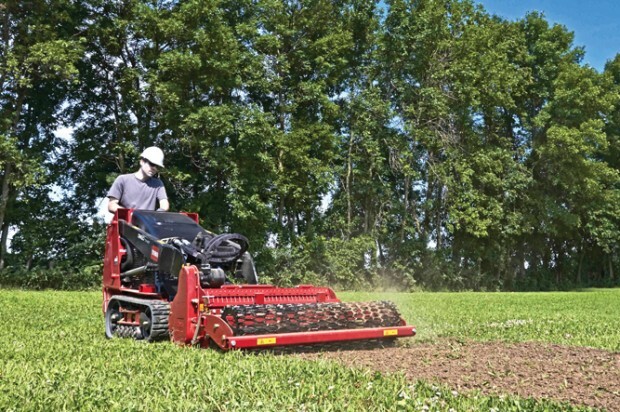 Instead of a dedicated stump grinder, trencher and auger, one compact tool carrier equipped with the proper attachment can handle all of those applications and many more. Regardless of the attachment on the compact tool carrier, all are relatively intuitive and easy to control. Even the most novice operator can quickly learn to successfully use a compact tool carrier and attachment, making quick work of any construction or landscaping project. Compact tool carrier attachments offer many possibilities. Whether the operator is drilling, scooping, trenching, breaking or even removing snow, there is an attachment that can do the task efficiently. Of course, each application warrants a specific attachment, and it is up to the contractor or operator to work with the equipment dealer to determine which compact tool carrier and attachments best fit the needs of the project. There are many things to consider when purchasing or renting a compact tool carrier, including whether to use hydraulic or non-hydraulic attachments. Many attachments require auxiliary hydraulic power to function correctly, so it is important that the compact tool carrier is able to power the attachment if hydraulic-powered attachments are being considered. Examples of typical hydraulic-powered attachments include breakers, backhoes and trenchers, but again, savvy contractors will want to work closely with the dealer to determine their equipment needs. For monetary reasons alone, many contractors choose a compact tool carrier with a variety of attachments over dedicated units because it offers a high level of versatility with minimal investment. Simply put, this allows the contractor to accomplish a myriad of tasks with only one machine. When matching up attachments with specific applications, it is important to consider any unique challenges that the jobsite may present. With that in mind, here is a list of our Top 5 essential attachments that prove themselves to be useful in a variety of applications. The adjustable fork’s main purpose is to move material from point A to point B quickly, efficiently and safely. Forks can move pallets, trees and shrubbery for landscaping applications and can aid in loading and unloading material from a trailer or truck bed. Budget-conscious contractors understand the importance of logistics around the jobsite, and adjustable forks are a heavy-duty, versatile solution for nearly any construction site. Instead of requiring a dedicated skid steer loader or pallet jack to transport materials, a compact tool carrier can deliver the same high level of performance — while also doing the job of many other machines when equipped with the proper attachments. Another essential attachment for the construction and landscape contractor is the soil cultivator attachment. This versatile attachment can be used to cultivate and level soil with ease. In addition to preparing the soil for seeding or landscaping, it will also bury debris like stones, soil clods and grass. This single attachment can transform rough terrain into a perfect planting bed in a single pass and is a must-have for any contractor who works in landscaping and site prep. Ideal for digging holes in a variety of widths, the auger power head on a compact tool carrier can handle large- and small-scale digging projects in minutes. Apart from the standard auger head, some manufacturers like Toro also offer a universal swivel auger power head, which allows digging plumb holes on the face of a slope. One thing for budget-conscious contractors to consider when choosing an auger head attachment is whether the application calls for an emphasis on torque (power) or an emphasis on bit speed (rpm). Each application is different, and it’s important to select the proper attachment for the job. The general rule of thumb is that for larger holes maintaining a constant spin speed is crucial, so the operator would want to use a high-torque head. In contrast, a universal swivel drive head produces faster speed for smaller holes. Regardless of the application, a compact tool carrier armed with an auger head certainly provides a more efficient solution than traditional hole-digging methods. A solid alternative to purchasing or renting a dedicated trencher unit is a compact tool carrier with a trencher attachment. Ideal for landscape, plumbing and electrical contractors, a compact tool carrier with a trencher attachment not only will positively impact the bottom line, but it also offers a highly versatile trenching solution that can easily access hard-to-reach jobsites. Additionally, most trenching attachments are extremely intuitive, and even the average DIY property owner can easily manipulate the trencher attachment. 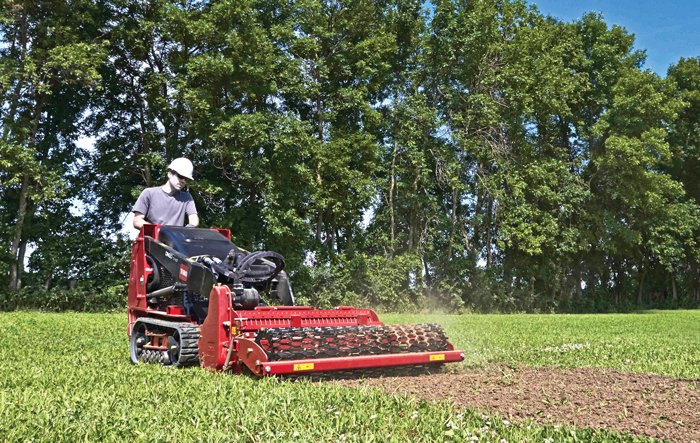 The value of a compact tool carrier and trencher attachment combination is easily realized in a variety of applications, from the installation of irrigation and drainage systems to electric, DSL or fiber-optic installation — and everything in between. Toro offers trencher attachments that can trench to depths of up to 4 ft and to a width of up to 8 in. Much like the auger head attachment, some manufacturers offer trencher attachments in both high-torque and high-speed options, providing a solution for any trenching application. The bucket attachment is arguably the most used and one of the most valuable attachments that you can connect to a compact tool carrier. Taking the place of its manual counterpart, the wheelbarrow, the bucket attachment allows the operator to transfer dirt, sand, landscape rock, mulch or any other kind of construction or landscaping material that needs to be moved from point A to point B. Incredibly useful in both landscaping and construction applications, the bucket attachment is designed for increased safety and efficiency over traditional material handling methods like carrying materials by hand or utilizing a wheelbarrow. Toro and other manufacturers offer buckets in a variety of sizes, and these buckets can be purchased or rented with or without tooth bars. When estimating the potential man-hours involved in a project, it’s important for the contractor to remember that there’s working hard, and there’s working smart. An initial upfront investment in the proper compact tool carrier and attachments can pay dividends in the long run by minimizing the potential for injury on site, while offering an intuitive solution to do the “heavy lifting.” There is an attachment for virtually every application, and seasoned contractors and weekend warriors alike can take advantage of the power and performance of a compact tool carrier on their next landscaping or construction job. Sean O’Halloran is the product marketing manager with The Toro Co., based in Bloomington, Minn.